If you want to know what the best (and worst) protein powders are for building muscle, then you want to read this article. The number one priority is simply to get enough protein in your diet; supplement or not. Animal-sourced protein tends to be the best with both whey and casein seemingly neck-and-neck. Vegan forms can also work. Generally speaking products marketed as “isolate,” “concentrate,” and “cold-filtered” aren’t that different from each other; hydrolysate is quite unique though. Whey protein is commonly referred to as the king of protein supplements. Why is whey seemingly the king here when there are numerous types of protein powders out there that all “work”? Do some work better than others and, if so, is it honestly a big enough of a difference to direct a purchasing decision? That’s what we’ll be discussing in this article. Cataloging the best and worst protein powders and comparing them when comparative data is available. We’re also going to cover the taste and mouth feel of these supplements; it’s one of the times when the user experience of simply taking the supplement matters in ranking. How Does Protein Help Build Muscle? What Are the Best Protein Powders for Muscle Growth? How Do Other Proteins Stack Up? What About the Protein Buzzwords? Generally speaking, protein helps build muscle because muscle is protein. Our skeletal muscle is not just something used to move our skeleton around, although that is it’s namesake. It’s also a large organ that can give or take amino acids (the molecules that, when chained together, form protein itself) to other organs on an as-needed basis. If the other organs get hungry for amino acids then the skeletal muscle, as well as both the liver and intestines (which also store amino acids for later use), can give the other guys amino acids for their own needs. However, these stores need to be replenished somehow and that’s why we need to eat protein. At the very least, sufficient dietary protein intake means our muscles maintain a comparable size. We’re replacing what is lost and keeping our stores topped up. But we don’t want our muscles to stay the same size, we want them to grow, and there needs to be a way to signal to them to grow. And that’s the other function of protein. Just like how exercise itself is a signal for muscles to grow, so too are some amino acids like leucine. Leucine is both a component of muscle but also a potent signaling molecule for a protein called mTOR which, when activated, tells muscle cells to collect and store amino acids. When muscles get the signal to grow they absorb and store a bunch of amino acids. By getting an amino acid that signals growth, paired with the amino acids that get stored themselves, eating protein satisfies both conditions for growth. So where do protein powders come into this? Honestly, it’s pretty much just for convenience and taste. Eating chicken breasts all the time gets tiring so it’s nice to be able to get a comparable amount of protein with a nice chocolate taste to it. But, with any popular supplement, different types and variations arise leading people to wonder if there is a “best” protein or whether taste is all that matters. The best protein supplements are going to be those that are tasty, cheap, and convenient; assuming they work, of course. There are quite a few proteins that work, some with other unique goodies in them or specific properties that might help guide a purchasing decision, whereas others are just not exciting. It’s made from the liquid portion of milk, the stuff that doesn’t coagulate when introduced to renin (an enzyme used in cheese production). The stuff that does bunch up, and is later turned into cheese, is casein protein. About 0.7% of milk overall is whey, and 2.8% is casein, so there’s about four times as much casein. 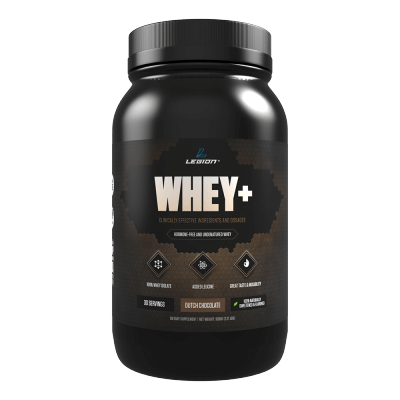 Whey is quite high in leucine and the other branched chain amino acids and is a respectable source of glutamine; all valuable dietary supplements by themselves. It’s possible that the benefits are explained simply by whey being a quickly absorbed bundle of essential amino acids with high leucine levels; the two are somewhat comparable after all. The above numbers were taken from this paper but seem to be derived from an in-print publication. These proteins can be beneficial for reducing blood pressure and may reduce cholesterol as well. Blood pressure reduction has indeed been noted with whey. Furthermore, due to delayed stomach emptying and less appetite seen with whey when compared to other proteins it could be argued that whey is “better” for fat loss diets. Plus, whey protein is very well absorbed after being ingested. For the purpose of this article we are going to use whey protein as the reference protein and compare the other types of protein to whey. If other forms are comparable then they’re pretty impressive and, if they fall behind, still fairly okay; second place isn’t anything to scoff at. And if you’re looking for a 100% naturally sweetened and flavored whey isolate protein powder, then you want to try WHEY+. It’s made from exceptionally high-quality milk from small dairy farms in Ireland, and it contains no lactose, which means better digestibility and fewer upset stomachs. Casein protein is the main protein in dairy that has gel-forming properties; valued for the consistency it provides to cheese products. If you want to test out these gel-forming properties then put a scoop of casein protein in a bowl and slowly add water or milk when stirring; you get protein pudding. Due to these gel-forming properties casein is absorbed slower than whey. Compared to whey, casein has slower and lower peak levels of amino acids but a more sustained release. Whey protein seems to be better than casein when it comes to looking at the rate of protein synthesis over a short period of time (likely due to the fast absorption of whey) but also in times when the muscle is not at 100%; in aged subjects and following muscle inactivity from a cast. But some studies suggest that, ultimately, the difference in muscle growth between whey and casein is more comparable than different. Regardless, if sometimes whey outperforms and at other times casein merely ties then I think we can give whey the unofficial win here. But whey can’t make pudding. Rice and pea proteins are sometimes referred to as a “vegan whey protein” since, despite coming from drastically different sources, they are somewhat comparable in their amino acid profile. Rice protein alone is pretty high in the essential amino acids and branched chain amino acids (BCAAs), with one study noting that 18% of the total amino acids were BCAAs. Pea protein is similar in how it is high in the BCAAs and also glutamine. Both rice protein and pea protein have, individually, been shown to be effective in promoting muscle gain when used as protein supplements. Both of these studies showed these proteins to be similar to whey protein supplements. Despite being effective on their own, they are commonly paired together not only for consistency and taste reasons (with pea having a thicker mouthfeel and rice being relatively smooth) but also because they form a complete protein source. So ultimately, at least over the short term (8-12 weeks) rice protein, pea protein, and their combination is comparable to whey protein supplements and a fine vegan substitute. They don’t offer too much more aside from the amino acids. One thing you should know, though, is that not all pea protein powders are the same. Some are higher quality than others, and unfortunately, there’s no way to know how any given pea protein supplement rates by just looking at it. That’s why choosing a good pea protein comes down to trusting the company that you’re buying from. If you feel they’ve proven their honesty and integrity and earned your confidence, then they should get your business. If not, though, then you should look elsewhere. For our part, we work hard to demonstrate our commitment to producing high-quality, science-based supplements, and to selling them honestly and responsibly, and if that approach resonates with you, then you should check out our 100% vegan protein powder THRIVE. 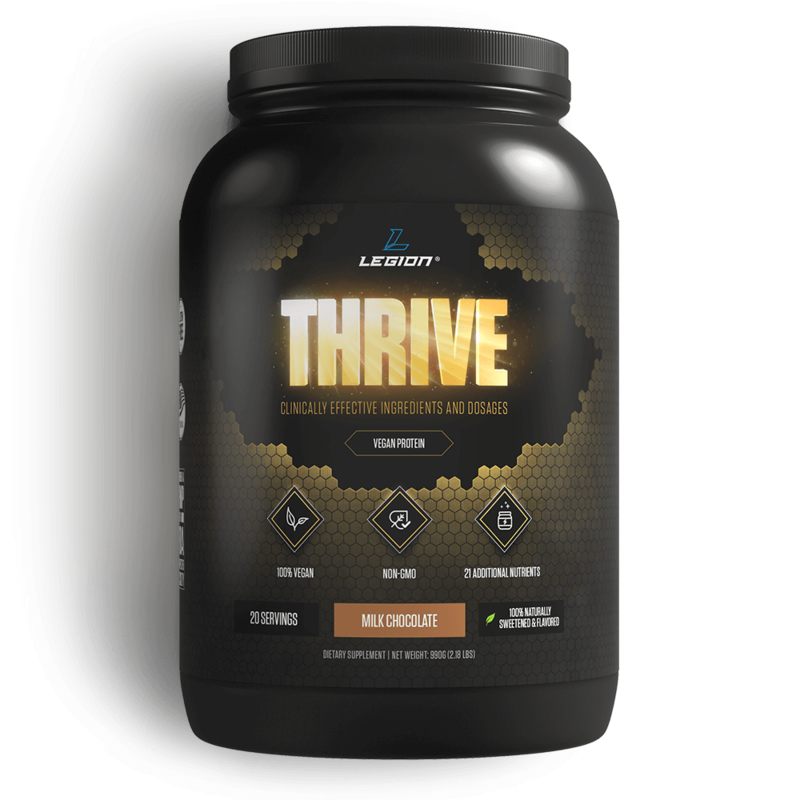 THRIVE is an affordable vegan protein powder that provides you with 25 grams of high-quality plant protein per scoop, including 23-grams of pea protein, along with 10 additional nutrients that vegan and vegetarian diets tend to be low in, and 4 enzymes to help you better digest and absorb it all. It’s also 100% naturally sweetened and delicious mixed in water, milk, or dairy substitutes, and contains no unnecessary fillers, dyes, or other chemicals. So, if you want to build muscle and lose fat as quickly as possible and improve the nutritional quality of your diet without having to eat more animal protein, then you want to try THRIVE today. So given how we have the two protein powders derived from dairy, and one that is made to somewhat mimic the dairy proteins, what about the other options? Is mimicking dairy protein all that is needed or do the other protein powders have their own unique properties. Are there actually “bad” proteins or are they all just different flavors of decent? Let’s get into that with a look at the obviously contested one; the only protein claimed to give men breasts. In the past, when studies on protein were in their infancy, researchers figured that they needed to have a “control” protein of sorts. Something to compare against the other proteins and use as a standard reference. This was soy protein. It was later found out that there are compounds known as soy isoflavones that can be healthy, but have minor estrogenic properties. They’re honestly not much of an issue in moderation but it’s never good to have something in your “control” protein screwing with the results. As such, soy protein comes in both soy isolate and soy concentrate. Generally speaking concentrates lack the isoflavones (they are treated with an alcohol extraction which takes a large amount of the isoflavones out of the soy) while the isolates contain the isoflavones. When we look at soy protein that lacks the isoflavones, and is basically just a vegan source of complete protein, it does seem to be comparable to whey as a protein supplement when timing is not relevant while less effective when used as an intra-workout. A possible long-term benefit to muscle growth associated with whey protein, increased satellite cell recruitment, also has not been seen with soy protein. All the above also applies to the soy protein containing the isoflavones but they also give benefits to older women who want a daily protein supplement to help mitigate bone deterioration. So, soy protein is sort of cool because it has unique properties due to being soy. You can choose not to take the isoflavones if you wish but, when it comes to something that can potentially interact with estrogen, soy holds a specific niche. But what if your protein also had an interesting molecule in it but it’s no longer allowed to be legally sold in the protein? Hemp protein was probably a really interesting protein source back before regulations prevented THC (the bioactive in marijuana) from being included in it but, nowadays, since it lacks any cannabinoids in it it just doesn’t have any unique properties. Specifically, it seems that hemp grown for textile industries and for oral consumption has been specifically bred to have less than 0.3% cannabinoids in them. This makes them too low to have any psychoactive effect. While it is theoretically possible that even the slightest bit of THC could have an effect in the body, hemp protein as a nutritional supplement is just not that well researched. Plus the amino acid profile isn’t anything special, it’s not too high in the BCAAs and seems to favor amino acids that aren’t known to have any interaction with exercise. It basically carries itself on the marketing associated with being one of the few complete protein sources for vegans while also being associated with marijuana. It’s pretty clear at this point that, when talking about how good a protein source is for athletics and body composition, that the major factor is the amino acids it provides. The branched chain amino acids and overall essential amino acid content are pretty important. Casein, soy, rice, fricking peas can all be comparable to whey protein if they just have similar levels of the good stuff as whey protein. So what happens when you don’t have the good stuff? The result is just, well, a bunch of amino acids and not the ones you even want. This may be due to how collagen and gelatin are both quite high in glycine, an amino acid that does have some cool properties but none related to exercise and body composition yet is incredibly cheap. Collagen/gelatin proteins are basically just very cheap ways to technically get the number on the label higher. The amino acids provided rarely, if ever, are beneficial to exercise. Choosing between whey, casein, or soy is not the end-all-be-all of choosing a protein. Many times you see other buzzwords associated with these proteins beyond the standard isolate and concentrate. Casein hydrolysate, cold-filtered whey protein, etc. Do these terms even mean anything or are they just meaningless words to make the label look prettier? Protein hydrolysates, or “hydrolyzed” proteins, first came onto the scene in baby formulas oddly enough. Milk is nutritious but also contains many things that a baby’s gastrointestinal tract can’t handle, as well as some allergens. Partial hydrolysis of whey has been investigated for potentially reducing how allergic infant formulas are. It is uncertain why hydrolysis was introduced into sports supplements but there are two major things that appear to be happening with them when compared to concentrates; they are significantly more soluble (to the point of casein losing its gel forming properties when hydrolysed) and the bioactive peptides may be able to act faster. Whey protein hydrolysate has been shown to have an effect on the intestines in a manner suggesting it may cause defecation (when whole whey failed to have this effect) and could have inherent antioxidant effects that act in the intestinal tract (of rats in this study). So it seems that acid hydrolysis can do some things to the quaternary proteins and make some unique ones, cool! For exercise, however? It’s effective as a protein supplement with no major differences when compared to the other variants (concentrate and isolate) for muscle growth, strength, and satellite cell recruitment (which may promote long-term muscle gains). There was a difference in fat loss favoring hydrolyzed protein though, no idea as to why but it should be looked into again. For now, the major factor with hydrolyzed proteins is that they are insanely water soluble to the point where it looks like you’re just drinking colored water. It would be cool if that fat loss result could be replicated. Also, generally speaking, proteins that are hydrolyzed get a pretty bitter taste associated with them (bad enough specific studies have been conducted to try and cover it up). It can be covered up with flavoring agents of course but, just be warned, if you have the option to buy unflavored and unsweetened hydrolyzed proteins then don’t. If you did anyways, adding sweet and tart (perhaps sucralose with malic acid) is the way to go. Cold filtration is a process by which protein is chilled during processing in an attempt to lessen how much of the protein gets denatured. Denaturing, in this sense, refers to when amino acids actually lose their “amine” group which would make them utterly useless nutritionally. Proteins can take some heat but there’s a point where they break down beyond repair. Each protein out there has different sensitivities to heat and this process could be useful to some types. However, whey isn’t something that is overly sensitive to heat. It’s also not like standard whey processing uses enough heat to destroy the whey anyways; that would defeat the purpose of all whey supplements. Furthermore, there appear to be no studies conducted comparing cold-filtered whey protein versus other variants when it comes to any health parameter. It seems like it’s just a buzzword. At the end of the day what matters most is that you eat some protein. Beyond that it does matter what type of protein you take in but, unless it’s during or immediately after a workout, the type of protein may not matter as much as you would think. Whey protein still does appear to be the best, but this is mostly because it performs equally to other forms of protein like casein, soy, or rice/pea in 80% of situations while edging out a win in those last 20% of cases. Whey still seems to be the best when it comes to eating protein around workouts, with some hints that it may also be a better option for fat loss diets. If you want to buy a protein supplement then get yourself a good whey isolate supplement, or one with a little bit of concentrate in there, it doesn’t really matter as long as it’s quite soluble. Oh, and if you decide to go down that route, may I suggest you get some WHEY+? If you have money to burn and want to take something during your workout, consider a whey or casein hydrolysate; just be aware that they’re more bitter than a footballer with a 20 game losing streak. If you don’t have the funds, or the desire, to get a supplement then don’t worry too much. It won’t make or break anything in the long run. What’s your take on the best and worst protein powders? Have anything else to share? Let me know in the comments below!